Larry's Incredible Century Plant, Spring 2009: A - Larry's Incredible Century Plant, March 27th - Watch it Bloom! 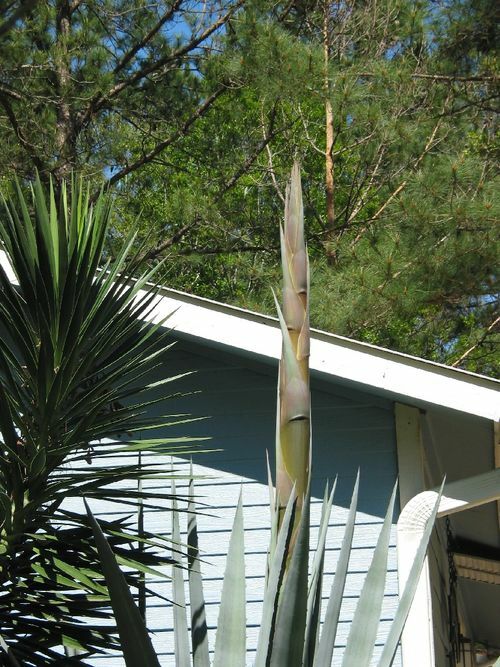 A - Larry's Incredible Century Plant, March 27th - Watch it Bloom! What a treat we have in store for us. Larry Smith submitted this photo along with this message. We'll be waiting for updates. Said Larry, "I wanted to show you what we have beginning to bloom in our yard. We hauled this century plant home about ten years ago. It was in a large pot and maybe four feet tall. We never expected it to grow to this size. It puts out babies every year, and we have some planted in various places... away from the house. We have been talking about taking it out because it is so huge, and maybe it heard us. We first noticed some new emerging "leaves" clumped together a few days ago. Then Saturday we saw that it was obviously going to be a bloom stalk. We have not seen a century plant this large blooming, so we don't know how high it will get. I will keep you posted on it's progress."